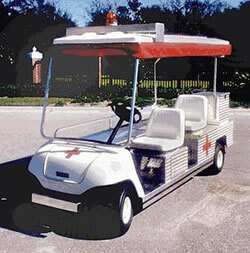 V112 ADA Vehicle Custom 75"
Come to the rescue when minutes count! Easy access for a stretcher & seating for nurse behind driver makes the V103 Ambulance great for quick access & areas standard ambulances can't reach! Perfect for festivals, etc. Deluxe Lights, Brake Lights & Sensor, Turn Signals, Personalized Ignition, Amber Strobe Light, Deluxe Mirror, 1- Pc Clear Windshield, Horn, Fuel Gauge, Strobe Light Bar, 48v Upgrade, Hour Meter, Battery Meter, Additional Compartment for Gurney, Siren/PA w/Speakers, Automatic Charger.